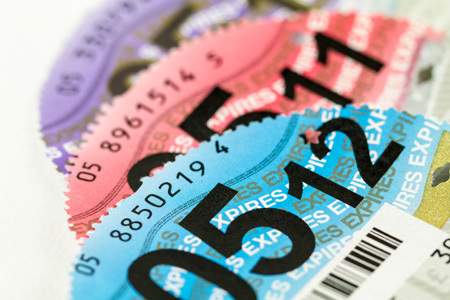 From October 1, you will no longer be required to display a tax disc in your motorhome or caravan towcar under new road tax disc rules announced last year. All drivers will still have to pay road tax, or vehicle excise duty as it’s officially known. The DVLA will store details electronically and motorists driving without valid tax will be identified using number plate recognition cameras. There will also be a new way to pay for your road tax. Currently you need to buy either six months’ or a year’s tax up-front, but from 1 November you’ll also be able to pay by monthly direct debit over 12 months. However, if you choose to spread the cost you can expect to pay an additional 5% charge. Payments will continue until you tell the DVLA you no longer own your vehicle. Motorists can continue to pay annually or bi-annually. You must tell the DVLA straight away if you plan on selling your motorhome or towcar. Failure to do so could result in a £1,000 fine. You’ll also still be responsible for taxing a vehicle you no longer own and will be asked have to pay any fines the buyer clocks up. You can’t sell your tax disc with your motorhome or towcar after the 1st October. Instead, you’ll get an automatic refund on any full months remaining and the buyer will have to register for road tax themselves. You must tell the DVLA before you drive a newly purchased towcar or motorhome or your insurance will be invalid and you could be fined £80. Customers in England, Scotland and Wales do not need to present Insurance Certificates when renewing their car tax at the post office. You will no longer have to display the paper tax disc on a vehicle windscreen. You will still need to pay vehicle tax and Driver and Vehicle Licensing Agency (DVLA) will hold a digital record. See here for details. Customers in Northern Ireland are still required to produce a valid Insurance Certificate when taxing a vehicle. I plan to buy a new camper van will I have to pay the new road tax levy as I would if I bought a new car. This is another way for the Government to make money,that nobody has picked up on. The seller gets a refund for any unused full months, so if the sell in the middle of the month, and the buyer has to pay from 1st of the month when he buys, the Government has been paid twice for that month. Blasted Gobment wins again no matter what you do. Would it be legal for me to pay my 12 months road tax for my campervan by monthly direct debit, then pick and choose the months I wanted to tax the vehical for. eg pay monthly by direct debit for june, july and august, then cancel the direct debit for september, october, november, before enabling the direct debit again for december etc. In response to your comment syd@glens of antrim, as far as we’re aware you must either tax your vehicle for the full 12 month period or declare the vehicle as SORN if it’s off the road. The DVLA website actually states that ‘Your vehicle must be taxed and insured unless you surrender your tax disc to make a SORN.’. It also states that you’ll need to get a tax disc if you want to use the vehicle again on the road. This expires your SORN. There’s more information on the DVLA website. You can fill in a SORN online and get a refund if one is due or cancel your monthly standing order if not. I gather classic car owners do this a lot.too. Check to date the SORN starts – last year it started on the first of the month you filled it in (instead of the end of the month) so you may have been driving vehicle which you subsequently untaxed! If I sell my motorhome mid month, I will not receive any refund on the road tax as there are no full months to refund, however if I buy a motorhome mid month (and contact DVLA before driving it away) I will immediately be liable for road tax. Previous owner loses, new owner loses, who wins I wonder ? Oh if you buy something with 12 months road tax before the 1st Oct you got a free year before you need to worry about it ! That’s right Rob. The buyer will not benefit if there are unused months left on the tax disc. They will have to renew the tax straight away. The seller can claim a refund from DVLA for any full calendar months left on the vehicle’s tax. However, they are also responsible for informing the DVLA of the change of ownership and will face a fine if they do not do so. My experience has always been the tax disc sits in a in tray for two weeks then gets processed on the 2nd or 3rd of the following month thus ensuring I lose at least six weeks tax happens every time I change my motorhomes and transfer my cherished number !!! Hi Robert – They can do it online in a matter or minutes, or they can go to the Post Office. If you chose to pay annually, how does DVLA plan to remind you ? I often forget until it arrives in the post or I notice my disc on the windscreen. The DVLA will send you a V11 or V85/1 renewal reminder when your vehicle tax is due to expire. If I sell mid -month,I will lose that month’s road tax,Then the new owner will tax it again for that month,DVLA getting double tax,multiply by many thousand car sales per an ,nice little earner!!!!! From October 1st you can take the tax disc out of your vehicle in-line with the new changes. Yet another ridiculous change from this government. Cars left parked on the road without a valid tax disc can be reported and removed, who is going to report a car without a disc under the new scheme? This is a dumpers charter, a potential thief with false number plates encouragement policy and another open door for immigrants to drive without insurance and MOT for as long as they like. Crazy but as those who have introduced it have public funded vehicles why should they bother? Should go without saying – the whole point of the article is that there won’t *be* a tax disc! Put tax on fuel the more you use the car the more road tax. That is one option Dave! Although not sure it’s one that most people would be in favour of. Down my road I have had a dozen untaxed/unroadworthy vehicles wich will now get away with not being taxed as they are owned by a car business and probably not registered to them. Who is going to bother to come down the road and enter all their numbers in a data base to check on payment of Tax. Only the law abiding MUGS are done again. It’s definitely a ‘grey area’ Jeff and Dave. Unfortunately there isn’t much information out there at this stage to reassure the public that this won’t be the case. Will people without ready access to online, or anyone else who wants to, still be able to pay for their tax at a post office? Am I the only one to see this?…..if you have to tell the DVLA in advance before driving the car ,then how do you get it home ?, as you have to send off the reg doc which obviously wont be handed over until you have paid for the car! if i want to buy a used motorhome will i be able to tax immediately so i can drive motorhome home? As vehicle tax is no longer transferable, you need to get the vehicle taxed before you can use it. You can do this using the New Keeper Supplement (VC5/2) part of the vehicle registration certificate (V5C) online or by phone – 24 hours a day, seven days a week – see here for details; or via your local Post Office branch during opening hours. How do you prove to the continental police, that normally require you to carry all documentation for your vehicle, that you are ‘legal’ on their roads? My tax disc was my way of knowing that my application for road tax was successful. Number plate recognition cameras? My close neighbour has been driving without tax for nearly 6 months,not caught yet. Yes,he has been reported,more than once. As this is going to save the DVLA money it should be cheaper on our tax but no if you want to spread the cost its even more plus 5% nothing new there then. Motorists driving without valid tax will be identified using number plate recognition cameras. These in the main are only operated on main roads so it will be ok for the local boy racers to run around the local housing estates and secondly we have now got rid of the Public who used to report untaxed vehicles. Yet again just the law abiding who are affected. Hopefully that won’t be the case Dave! Thanks Terry and Steve! We’ve corrected that line – apologies! Think you have got the Seller to Buyer a bit mixed up, it’s not up to the seller to tax the vehicle before the buyer can drive it? Well this bit is wrong..
should that not be the “buyer” will have to register……. This is an open invitation to crooks who use stolen or illegally purchasedd number plates.